EZ Crank adjustment allows for adjustments of 10' to 5'6"
The Attack System offers infinite adjustability and maximum durability all rolled into one! 4"x4" post is 3/16" thick - that's 50% heavier than any other goal post in its category. The bolt down anchor system allows you to take the goal down for storage. The EZ-Crank® adjustment means players of any age, size or ability can easily adjust the height of the goal. To adjust, simply turn the crank handle. Adjustable from 10' to 6.5'. The rim height indicator shows the height of the rim. The Spring Assist® reduces the effort required to crank the goal up, particularly benefitial for institutions at the elementary grade level. Optional padding is available. COMPARED TO OTHER MANUFACTURERS: 4" post systems by other manufacturers have LESS post to board extension and their lifetime warranty is a LIMITED warranty and does NOT cover intentional hanging on the rim. 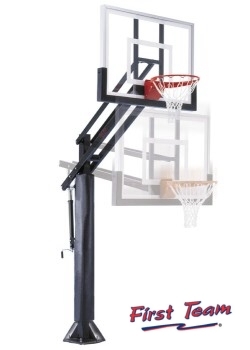 First Team 4" systems provide 36" of extension for safety and a LIFETIME SUPERIOR warranty covers intentional hanging on the rim by multiple players. First Team systems are the "Lexus/Mercedes" of basketball systems.